In class last week we discussed household debt and it’s influence on economic well-being in Canada. There is evidence that the debt levels of Canadians is too high. Below I show two graphs that provide evidence of the rising debt in Canada. 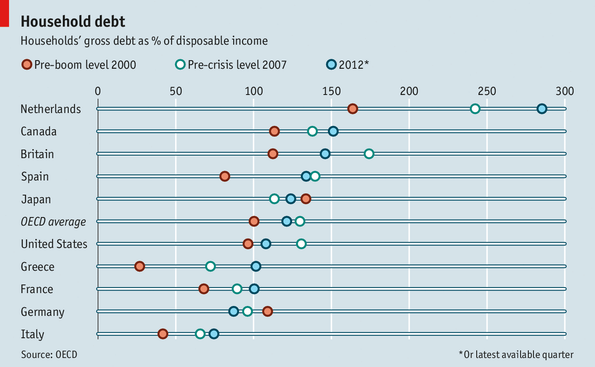 First, is a graph from the Economist comparing household debt as a percentage of disposable income across OECD countries. The graph presents a number of points for discussion. Let’s focus on the United States compared to Canada. The graph shows that the 2012 debt level in the US is far below the level of debt experienced in 2007 just before the housing crisis and subsequent recession. In contrast, see that Canada’s debt levels have only expanded since the recession. Below is another chart showing the debt levels over time from the Task Force on Financial Literacy. We see the debt to income ratio has risen dramatically since 1990. At what point does the rising debt become a social welfare problem in Canada, or has it already? Published by David Rothwell on September 15, 2013 at 12:29 pm under Uncategorized.